Custom bookmarks can put your marketing message in a place where customers are at their most relaxed and open minded, while reading. Few companies advertise with bookmarks, but in the right environment they can be one of the most effective marketing tools available. No need for “business bookmarks?” That’s OK! Bookmarks are perfect for clubs, organizations, or just for friends and family. 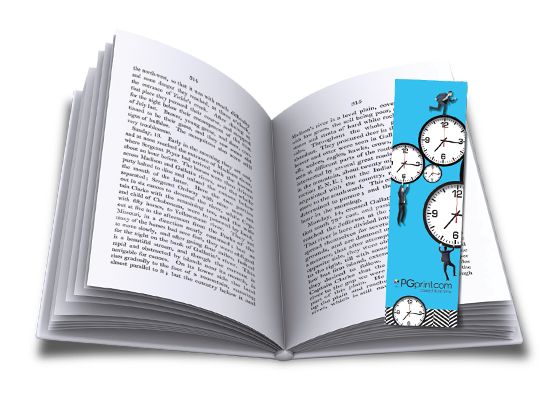 Make reading even more enjoyable with the personalized bookmark printing services offered by PGprint. Set your message apart and expand your brand to customers you might not have considered before by adding custom bookmarks to your marketing tools. PGPrint bookmark templates provide the specifications required to ensure your artwork is print-ready. The template files are PDF formatted documents that are inserted directly into your artwork to provide guidelines for size, bleed, trim and folding. Remember to remove our template from your final artwork before submitting your files to our servers. It was easy to work with the website. I uploaded the image to the template and I could tell what the final product would be like. The colors were true to what was on my computer screen and the UV coating enhanced the appearance. They were ready on time. All in all, I am very pleased with the product. Excellent service, product looks great and they completed the work quickly. PG Print is my new go-to for all my printing needs. They are all-around excellent!